Quality is hard to define, but you’ll know it when you see it. Circumspect Builders has been doing business in the Valley of the Sun since 1984. Starting with commercial carpentry, Circumspect Builders has grown to a full-service contractor specializing in residential remodels, additions, new construction and commercial construction. Our growth and success has come from our many successful relationships with past clients. We are a referral only business. Our customers do our advertising for us by recommending our services to their friends and neighbors. When you work with Circumspect Builders, you work with a team of seasoned professionals who take pride in “giving attention to the details” to make your dream home come true. We promise to be responsive to your needs, true to your vision and honest with our assessments. We stretch every dollar in your budget to make your vision a reality and always do what it takes to get the job done right. We won’t start a kitchen or bath remodel project in an occupied house until all arrangements and materials are on site or known to be readily available, such as new cabinets for a kitchen job. All of this is an effort to complete the project as soon as possible and not have one single day without noticeable progress. 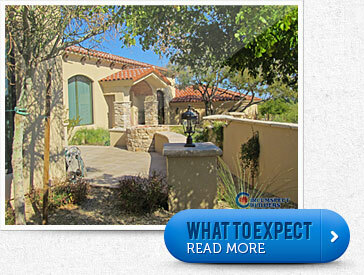 We understand that homeowners do not want to see any delays in completion of a remodel. We will make every effort to protect the homeowner’s belongings while working in their home. Often that means setting a mini mobile on site to store furniture and other valuables, or arranging for air-conditioned space. When building a new house we always gather soil and civil engineering to assure a solid foundation. When building a room addition, the space planning and overall exterior appearance is carefully designed so that the addition does not look or feel “stuck on”. Circumspect Builders has over 25 years experience building in the Valley and we know how to handle all the unexpected elements. We are a team player and have relationships with architects, designers, engineers, inspectors and subcontractors to bring to your project proven professionals with a track record for quality and value. During the planning stage of any project Cost vs. Value considerations are discussed throughout the process.